Tangible, relatable, natural, unifying, broad—all concepts expressed through the artwork loaned to Shippensburg University’s Kauffman Gallery from the Chelsea-based Nancy Hoffman Gallery during the Earth, Air, Fire, Water exhibit this winter. Each semester, Michael Campbell plans trips to New York City with his art and design students where they digest about three dozen art galleries in one trip. During one of these trips nearly twenty years ago, he met Sique Spence, gallery director at Nancy Hoffman Gallery. Soon after, Campbell asked Spence to judge an exhibit at Ship, and the two have maintained a working relationship since. 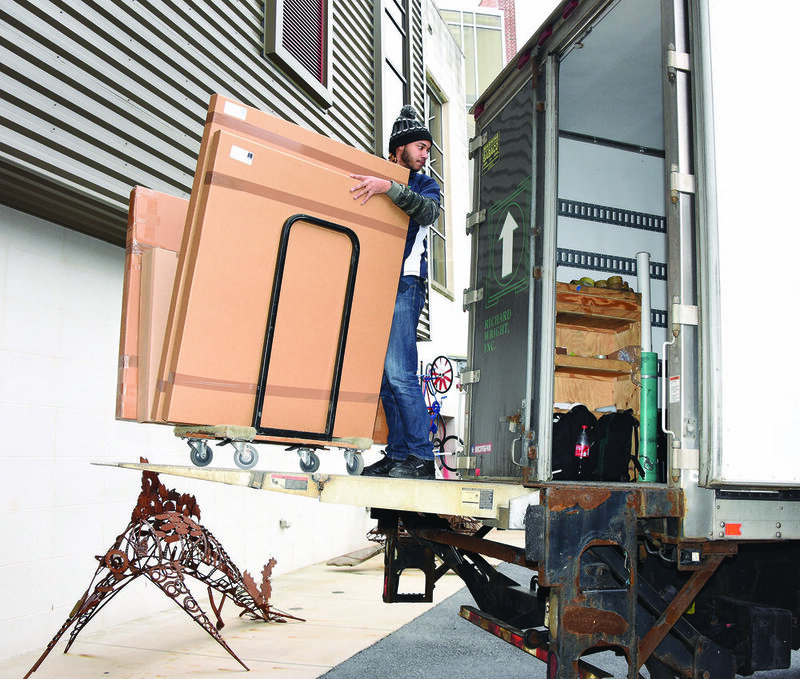 Crews unload artwork from New York City. This semester, Spence helped Campbell bring a little New York City to Shippensburg. In just over a year, they planned and executed an exhibit for Kauffman Gallery with nearly thirty pieces from nationally recognized artists. Earth, Air, Fire, Water displayed varied mediums, including watercolor, acrylics, oil, graphite, and sculpture. Students today can find anything online—images of the Sistine Chapel, prints from Andy Warhol, and pieces from the Nancy Hoffman Gallery. Campbell said technology certainly provides students greater access to more resources. However, it also makes it harder for students to connect with artwork in a more personal way, he said. “Technology isn’t a replacement for standing in front of a painting, sculpture, etc., that takes up your whole peripheral. (These galleries) can easily hang something that’s 15 feet square—we’re not accustomed to viewing something like that,” he said. Over the years, Campbell has noticed it’s a challenge to get students on the New York trip. Some students can’t afford it, others don’t have the time, and some don’t see the value. So, he floated the idea past Spence to curate an exhibit of Nancy Hoffman art at Kauffman and bring these pieces to the Shippensburg community. Campbell wanted his students and the community to experience the quality and skill of professional artists represented in one of the art capitals of the world. When he, Spence, and Nancy Hoffman first discussed the exhibit, they strived to illustrate three things—the content of the work, which could be literal or conceptual; the skill level and competency of the artists; and the scale of the work. From the arrangement of the pieces to the lighting to the traffic flow, the hours that go into planning an exhibit create a dialogue, he said. By walking through the exhibit, he hoped visitors became more conscious of their surroundings and environment. Sique Spence, director of Nancy Hoffman Gallery, visits Kauffman for the exhibit opening. The exhibit title Earth, Air, Fire, Water was chosen to reach a broad audience and help visitors connect with the pieces in the gallery. The artwork illustrated each element through varied mediums, included paintings, sculpture, photography, video installation, and more. Campbell wanted students from biology to English to engineering and business to find as much value in the artwork and exhibit as his art and design students. Art and design senior Dessy Cashell is a gallery attendant and helped Campbell assemble the exhibit. She spent more than a week unpacking paintings, arranging lighting, painting walls, and more. “I’ve never helped unpack anything that’s 5-by-8-feet,” she said. Working behind the scenes gave her a new appreciation for the artwork and exhibit. She experienced how delicately the pieces were packaged and how they were assembled. She glimpsed the light pencil lines behind a giant watercolor, the texture of an oil painting, and pencil drawings that were so detailed they looked like photographs. Beyond the opportunity to intimately experience the artwork, the university and neighboring community had the chance to speak with Spence. Prior to the gallery opening in January, Spence met with students and faculty in Hubert Art Center to share her story. She also spoke with visitors as part of the exhibit opening. Students asked about her background, responsibilities, most rewarding experience, and funniest gallery experience (which involved comedian, musician, and art collector, Steve Martin). She discussed diving into the art world, shared what led to her position at Nancy Hoffman Gallery, and imparted advice to the room of young artists. As part of the exhibit, Campbell reached out to local schools and scheduled mini lessons with area art teachers. In February, five elementary art teachers from the Chambersburg Area School District visited the exhibit. “This improves our understanding of art, which we then take into the classroom,” Paula Conca said. Professor Michael Campbell (right) talks with art and design students at the exhibit opening. The teachers, who have all taken extended studies classes with Campbell over the summer, have found that many of their students don’t visit art exhibits or museums. Students are fascinated to learn that their teachers draw, paint, and sculpt. “I don’t think they’ve ever been exposed. I don’t think anyone ever talks to them about it,” Nace said. 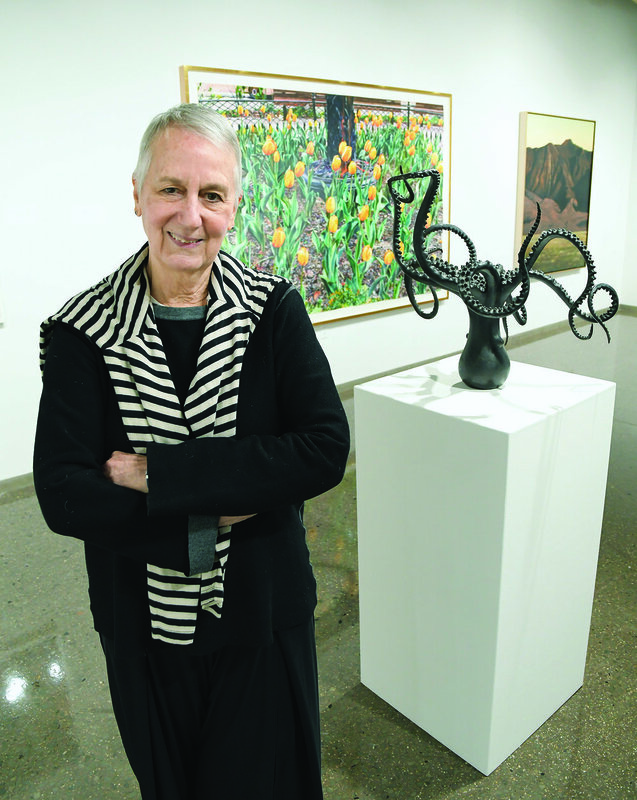 Sharing the skill level and techniques of professional artists at Kauffman Gallery is a treasure, Conca said. She and her coworkers value the opportunities Campbell presents to the community with shows like Earth, Air, Fire, Water and the outreach that accompanies it. “We have a community who values this and wants it to be here,” Campbell said. Sique Spence, director at Nancy Hoffman Gallery, chats with art and design students and faculty about her work and experience.